At the top of the list is going to a football game, hopefully an Auburn game! Carving a pumpkin is also on my list...call me basic if you want, but Chris and I did this two years ago (we carved a super cute cow into our pumpkin) and I can't wait to do it again. I want to carve our farm brand into one this year! The fair has been on my calendar since I found out when it was coming to Montgomery. Cole Swindell will be playing and I am so, so excited to see him! I'm a fire-bug, I just can't help it. There's something about having a bonfire and roasting marshmallows that just makes me realize that fall is finally here. The crock-pot is my favorite cooking tool, especially for Fall and winter. I have bookmarked tons of recipes on my Pinterest slow cooker board that I can't wait to try out. From pork chops to cheesy bacon potatoes, I've got them all ready to try which will be perfect for when my student teaching starts and I need an easy meal. Live music is my absolute favorite. Chris and I saw Riley Green (side note: YouTube his song Bury Me in Dixie if you don't know him) this past weekend & we definitely want to hear some more live music before it gets too cold outside to do so! On October 20th it will be the one year anniversary of Chris proposing to me, he did it when we were trail-riding so I think I would like to take a trail ride around that date to kind of commemorate that :) Plus trail-riding in the Fall is just SO much more comfortable than riding in the summertime. Just like trail-riding, hiking is much better in the Fall than in the summer. We're blessed to be less than 20 minutes away from beautiful Cheaha Mountain (which is the highest point in the state of Alabama). I hope that we can get in at least one or two good hikes before it gets too cold outside. I hope y'all enjoyed my fall bucket list...what do you have planned for your Fall? Head over to BraveLoveBlog and see what is on everyone else's bucket lists! Neat idea to narrow it down to a fall bucket list. Summer is my favourite season, and I'm struggling to deal with the changing of seasons. This helped me remember that there are lots of fun things to do in the fall as well. I love your fall bucket list! You'll have to share some of your favorite crockpot recipes! 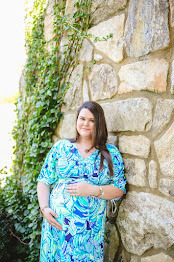 Reading through your list makes me long for those cooler temperatures and crisp leaves of Fall! Can't wait! Love your fall bucket list!!! Once September hit, I couldn't resist baking a fall dessert, so I made apple oatmeal bars. They were so good! That sounds delish, that may have to be the apple dessert I end up making! I need to add #5 to mine! I love how easy and delicious crockpot recipes can be! I love crockpots. My favourite invention and so perfect to help me meal plan during my busy weekdays. I will be following your pinterest board for crockpot recipes. They look amazing and super easy. A fall bucket list is such a fun idea! I'l have to make my own :) Great post! Love the list! Great post! In all the years I have lived in the US I have never carved a pumpkin but have always wanted to. I will add this activity to my fall bucket list immediately. 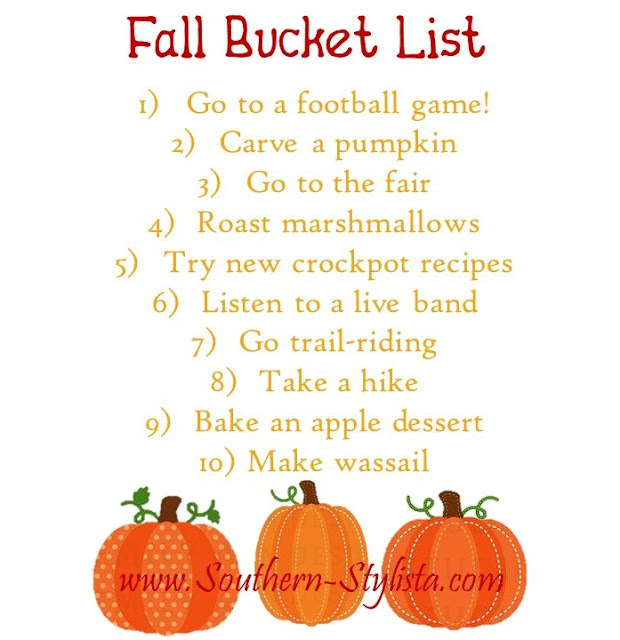 Love this fall bucket list! I have yet to ever carve a pumpkin- yes please! I love breaking out my crock pot for the fall! Love the bucket list! Especially going to a football game! Great Fall checklist! #4, #7 & #8 are definitely on my list! That's a great idea, it definitely helps you channel your energy into fun things! Awesome Fall bucket list! I'm gonna try to at least do five of these!